"The signs of emergencies are varied and can be subtle. They may be apparent before or during the dive. A diver's ego or peer pressure may cause the diver to disguise a problem, such as a lack of competence, inadequate experience, overconfidence, anxiety, illness, or distress. Such problems may show up on the boat before anyone gets in the water. All divers should adopt the credo of the cave and technical diving communities: Any diver can call any dive for any reason at any time. No question are asked - and the credo applies before the dive even begins. All divers should agree to this as part of the predive briefing. If more divers felt comfortable not making a dive because it was beyond their experience, or they didn't feel well, or their karma was all wrong, or whatever, there would probably be fewer problems." In the photo below, author Dan Orr does a book signing as part of the "Immerse Yourself Lecture Series" at the History of Diving Museum in Islamorada, Florida in 2015. Get Dan's Book HereDan Orr, past President and CEO of Divers Alert Network (DAN), is known as a first-class educator and longtime ambassador for the diving industry. 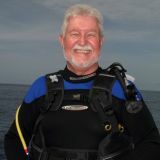 A veteran diver of more than 40 years, Orr joined DAN in 1991 and immediately established the DAN training department and the Oxygen for Scuba Diving course, a standard in the dive industry. Orr has held membership and leadership positions in many notable diving organizations such as National Association of Underwater Instructors (NAUI), Professional Association of Diving Instructors (PADI), Association of Canadian Underwater Councils (ACUC), Young Men's Christian Association (YMCA), National Academy of Scuba Educators (NASE), International Association of Nitrox and Technical Divers (IANTD), Undersea & Hyperbaric Medical Society (UHMS), National Association For Cave Diving (NACD), the Historical Diving Society, Academy of Underwater Arts and Sciences, the Institute of Diving, and the Explorers Club. He is chairman of the board of the Historical Diving Society and secretary of the DEMA board of directors. He has several specialty certifications, including full cave diver, rescue diver, and rapid response rescue and recovery. Orr has authored, coauthored, or reviewed more than 15 books and manuals on scuba and various aspects of scuba safety and rescue. Monday, 08 May 2017 Does Scuba Diving Have a Retirement Age?